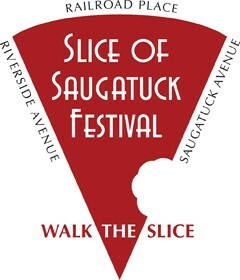 Seven years ago, the 1st “Slice of Saugatuck” street festival drew 27 participants, and a few hundred people. For this Saturday’s event (September 8, 2 to 5 p.m.), 56 establishments have signed on. A crowd of more than 2,000 is expected to stroll the streets, nibble food, listen to live music at 7 venues, and enjoy kid and family activities like an obstacle course, bouncy houses and Maker Faire area. The list of attractions includes over 30 restaurants. They’ll put tables outside, open their doors, then let the fun begin. Slice of Saugatuck also boasts 2 beer gardens with wine, plus specialty drinks at many venues. After the festival, a Saugatuck Happy Hour keeps the celebration going at most restaurants and bars. Musicians include the Mill River Band, Silver Steel, the 5 O’Clocks and School of Rock. there are dance and taekwando demonstrations too. More than 20 stores and businesses participate as well. Newcomers this year include Mystic Market, Coldwell Banker and Effi’s Salon. The “Slice” name comes from the street fair’s shape. Ranging from Riverside Avenue on one side and Saugatuck Avenue on the other, narrowing to Railroad Place, it resembles a pizza slice. Of course, for many years Saugatuck was a heavily Italian neighborhood. There are still plenty of premier pasta-and-pizza places there — along with restaurants specializing in seafood, steaks, Mexican and Thai cuisine and more. But you know that already. Saugatuck is a favorite destination for Westporters, and everyone else in Fairfield County. It’s a little slice of heaven, right here in town. 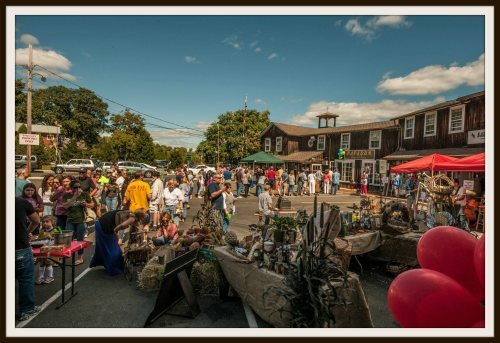 This entry was posted in Entertainment, Local business, Organizations, Restaurants, Saugatuck and tagged Slice of Saugatuck, Westport-Weston Chamber of Commerce. Bookmark the permalink. Might be better to get off exit 18.